This all-in-one cooler is the ultimate accessory to any outdoor event. Included with this tote is a cooler, a propane BBQ grill and a 3-piece BBQ tool set. The removable cooler holds up to 24 12-oz cans and features a water resistant and insulated PVC liner that zips to attach itself to the main tote. Inside the lid of the cooler is a mesh pocket that fits a large icepack. 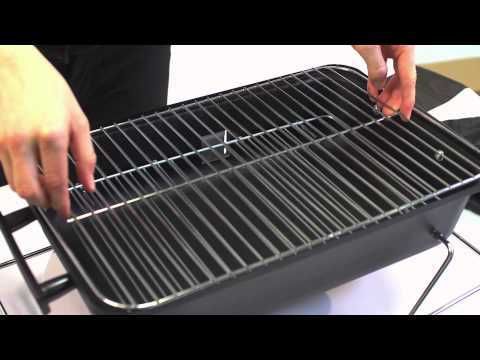 Unzip and remove the cooler from the tote to see the included BBQ charcoal grill with lid. The zippered pocket on the front of the tote holds a 3-piece stainless steel BBQ tool set. These tools feature aluminum handles and safety thumb grips. The outside of the tote has three large zippered pockets for added storage, an adjustable shoulder strap for easy transport, two drawstring pockets to hold propane tanks (not included), a water proof base and a stretch cargo cord for carrying blankets, magazines, towels and any other personal items that you may need to bring along. Bring the party with you wherever you go with this Vulcan all-in-one tote. Cooking Grid Dimensions 16 X 10 1/2"
16 X 10 1/2" 21 1/4 X 15 1/4" 14 X 10" 21 1/4 X 15 1/4"